Recently, I noticed my year-old iPhone 6 Plus was acting quirky. I first started having problems a couple weeks back while using the EarPods. First, the onboard volume buttons on the cable stopped working. Then, the microphone started wigging out. So I figured the earphones had simply gone bad. I pulled out my backup pair of EarPods. Then I considered a separate iPhone issue that was simultaneously annoying me. It had to do with my nightly ritual of charging up my trusty iPhone before I went to bed. I began to notice that inserting my Lighting charging cable didn’t create that confident ‘clicking’ sound anymore. The cable went in, but it felt like the connection wasn’t firm. On occasion, I had to push in the cable a second time to activate the charge. It was as if… the connection was failing. As if something was blocking it. Perhaps not so surprisingly, the hole was partially filled up with pocket link and dust from the right front pocket in all of my pants. 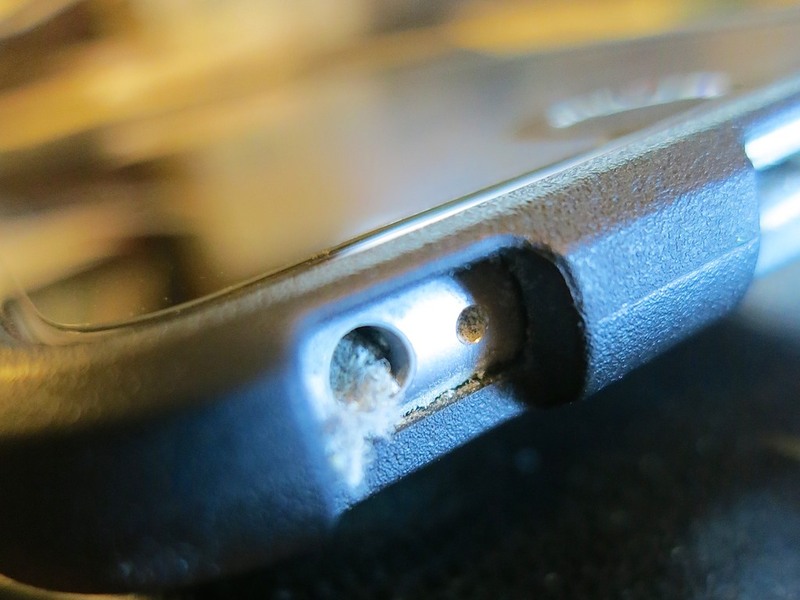 I guess it’s been building up over the past 11 months, and it finally grew to a large enough mini-mass, which had been crammed to the back end of the jack hole through my daily charging cycle. Would this prevent the connector from seating properly? It was time for some emergency surgery. So I took a pin and carefully extracted portions of the dusty mass until all was clear again. A toothpick would work too, and I imagine occasionally blowing in some compressed air would be a deterrent to prevent dusty build up. Then I peered into the EarPod jack. Same issue? And then I felt it. The spongy muck. Yep….identical problem… not a surprise. So I carefully performed the same procedure. And voilà… my EarPods suddenly worked again! Who knew pocket lint could be so destructive? It makes sense that over the course of months, bits of dust and pocked lint will inevitably enter the holes in your iPhone. That said, I never had a problem with the earphone jacks of my older iPhones. Perhaps that’s because they weren’t located on the bottom of the iPhone next to the Lightning jack. And as for the Lightning connector problem… I jumped from the 4S to the 6 Plus… so this is my first experience with a Lightning port. If your iPhone has been living in your pants or purse for a while, you might want to think about giving it a lint inspection.